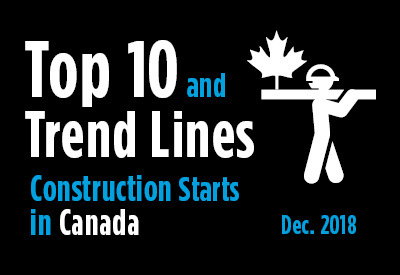 The accompanying table records the 10 largest construction project starts in Canada in December 2018. Also included is the latest trend graph on starts. This looks at 12-month moving totals of the civil and non-residential building categories in Canada. *For example, the December 2018 figure is the sum of the monthly numbers for January 2018 through December 2018.